"Throughout her childhood, Elizabeth Koehler-Pentacoff frequently visited Rosemary Kennedy, President John F. Kennedy's sister. Why? Koehler-Pentacoff's aunt, Sister Paulus Koehler, a Franciscan nun, was Rosemary's devoted caregiver at St. Coletta in Jefferson, Wisconsin for fifteen years and her driver and travel companion for over thirty. The resulting book, which will be will be the first about this mysterious Kennedy, chronicles Rosie's life along with that of the author's aunt, and delves into the similarities between the two families. 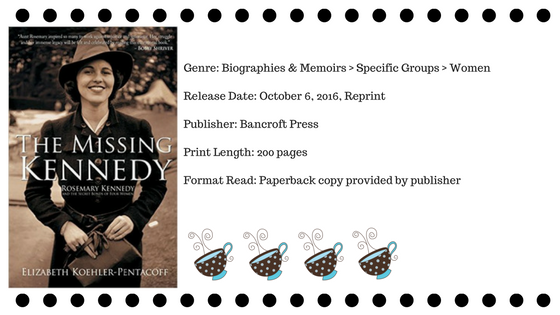 It includes more than 100 photos, many of them never before seen private, Kennedy quotes from the author's interviews, and anecdotes about Rosemary and her famous family. The book delves into Rosemary's misdiagnosed condition, why her father sought an experimental brain surgery for her without his wife's knowledge, how he kept this fact hidden from the rest of his family for twenty years, and what Rosemary was actually like after her lobotomy. And it will show how Rosemary was the catalyst behind the Special Olympics and related legislation from 1960 to the present. The Kennedys considered the author's aunt to be a member of their family. Through the author's relationship with Rosemary, Sister Paulus, and her other relatives, the author discovered how family, faith, and silence intertwine to strengthen or destroy our relationships, no matter our status or circumstance in life, whether one comes from in a rich, extraordinary family or a poor, ordinary one." When I was contacted by the publisher of this book, I was ecstatic. It's not clear when or where but I had heard about this book somewhere before. All I remember is that I was intrigued & really, really wanted to read it. I even told the publisher this upon being approached. I've always been a fan of most things John F Kennedy & 'Camelot' related. However, I'd never taken the time to research much about the rest of the family. This was my chance. Due to the hectic life that is mine, it took me a little longer than expected to actually pick the book up to read. But let me tell you- Once I started reading, I flew through the pages with such eagerness. Now I need to note: I am usually not a fan of nonfiction books. I mean, I've read very few in my lifetime that have actually kept me interested enough to finish. This book being one of those few. I loved how the author shared stories from both her family & that of the Kennedy's. However, the way the book was structured left some of the stories feeling disconnected when taking the advertised book subject into consideration. Readers go into the book expecting to hear more about Rosemary than what is provided in the first half. Things do come around to intertwine during the last half of the book but to many, this may be too little too late. Personally, I'm glad I hung in there till the end. The relationship between the Koehlers & Kennedys truly was inspiring. Just like Rosemary herself!